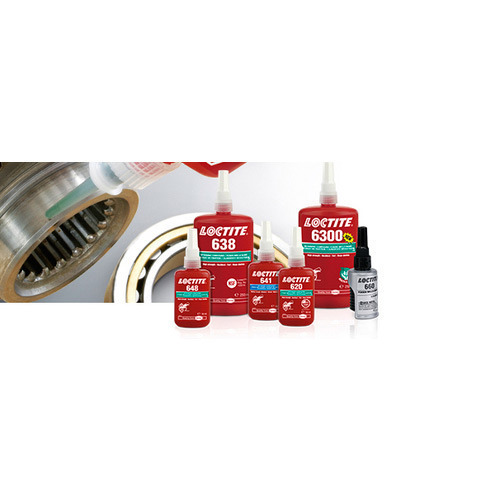 Retaining products have a high load-bearing capacity – with LOCTITE you can find the right product for cylindrical parts. Find out more here! LOCTITE retaining products secure bearings, bushes and cylindrical parts into housings or onto shafts. They increase maximum load transmission capability and uniform stress distribution and eliminate fretting corrosion. Applied as a liquid, they allow 100% contact between mating metal surfaces, eliminating the need for more expensive designs, time consuming machining and even the use of mechanical methods. Higher load transmission and better performance with existing designs and geometry. Equal performance with relaxed tolerances. Reductions in the size and weight of an assembly. Pins, key/keyway assemblies have uneven distribution of mass, an imbalance that can lead to vibration at high speeds. Splines and serrations cause high stresses due to the “notch effect” that occurs in the area of a key. And they have high machining costs. Clamp rings, press fits, shrink fits, and taper fits rely on friction alone to transmit torque, therefore they are limited by material, surfaces and design. Close tolerances are needed to obtain specific load capacities, leading to high production costs. Interference fitting creates stresses in the components that can lead to failure, particularly when combined with operational stresses. Welding and soldering: only compatible metals can be joined, the parts can be distorted by the high temperatures required. Heating of the material can lead to residual stresses and structural degradation. Disassembly can also be difficult or impossible. We are proud to be one of the leading Distributors of Industrial Products in the field of Metal Cutting tools, Cutting oils and Lubricants, Machine Tool Accessories, Industrial Adhesives, Tapes, Abrasives, Band Saw Blades & Utility Products (Intelligent compressed air products). We cater to wide variety of Industry spanning from Automotive Industry, General Engineering, Defense, Railways, Textile, White Goods & Appliances, Bath fitting, Electronics, Wind Mills, Aerospace, Stainless Steel Fabrication and many more. The fact is we have something to offer to every kind of Industrial Segment. Product range includes HSS, solid carbide and Indexable tools for Turning, Milling, Drilling, Reaming, Boring, threading, Grooving, Saw Cutting. (We represent brands Sandvik Coromant-AB Sweden, Dormer-UK, AMEC-USA, Emuge GmbH, Morse-USA, KTA-India); Cutting Oils and Lubricants like Metal Cutting Oils, Hydraulic Oils, Spindle Oils, Rust Preventive Oils, Chuck Pastes, Spindle Greases etc. from Fuchs Germany; Abrasives for Stainless Steel Fabrication, body preparations before Painting and Finishing Application after Painting, Cleaning and De-burring of Machined Components (we represent 3M-USA & Osborn Germany); Machine Tool Accessories like Key Less Drill Chucks, Revolving Centers, Face Drivers, Power Chucks, Power Cylinders, Mechanical and Hydraulic Vices, Universal Heads etc. from Rohm GmbH; Industrial Adhesives Like Cynos, Thread Lockers, Thread Sealants, Gasketing Products, Retainers, Structural Adhesives Epoxies, Maintenance Aerosols, Contact Cleaners, Wear Resistant Coatings, Anti-seize Products from the original Inventors of Anaerobic Technology Loctite from Henkel GmbH; Industrial Tapes, Double Sided VHB Tapes, Tissue Tapes, Masking Tapes, Gold Masking Papers from the world leaders-3M. Each Product is supported by a dedicated team of highly trained & experienced professionals, who possess the required skill and knowledge for quality work.